One of the best ways to grow your wealth is to start an online business. And the easiest way to get started in ecommerce is to resell existing products. Basically, you buy products at wholesale prices and then turn around and sell them for profit. There are no product development costs, no costs of manufacturing and most domestic wholesalers have minimum purchase requirements that are less than $300. However if you decide to go this route with your business, you’ll need to look into getting a resale certificate to save on your taxes. First things first. Many states require sellers to collect sales tax when you sell items online. Things get a little crazy when you’re in the process of buying and selling for resale because of sales tax. Imagine that you decide to buy items from a wholesaler. They charge you sales tax. Then, of course, you have to either eat the cost and reduce your profit margins or increase your prices for your customers. Neither of these is an ideal option. This is where the resale certificate comes into play. A resale certificate allows you to skip paying sales tax when you buy items you plan to resell. This works for buying wholesale items you plan to sell, as well as buying supplies for items you plan to assemble before selling. In today’s digital world, you don’t necessarily need a piece of paper for your certificate. Just apply online with the appropriate authority and you’ll be issued a number that you can share with your supplier. Keep the number in an accessible place so you can use it quickly and easily. Every state has its own tax laws, so make sure you do your own research where you live. Because every state has its own sales tax laws, you’ll probably run into different scenarios when you apply for your certificate. 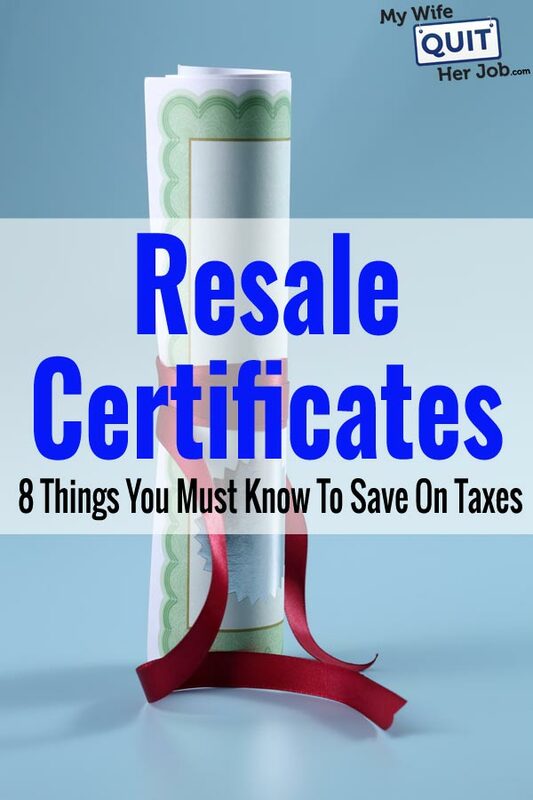 In some cases, your resale certificate might also have the same number as your sales tax license. If that’s the case, you might only need to fill out the paperwork once. Double-check your state’s laws, because there are places where you need to have separate sales tax permit and resale certificate numbers. Anytime you start a business in any state, do your due diligence to find out if you need to collect sales tax and be in compliance with the state laws governing your customers. Today, thanks to the increasing number of states that require all online sellers to collect sales tax from their residents, many ecommerce shopping carts are equipped to manage this item. For example, both Shopify and BigCommerce offer the ability to collect sales tax from any locality in the world. Some states won’t honor out-of-state resale certificates. In most cases, you’ll be able to use your resale certificate to purchase wholesale or bulk items from out of state without having to worry about paying the sales tax. But, as always, there are exceptions. In some states, only in-state certificates are accepted. My business is based in California, so if I buy something from a wholesaler in California, my resale certificate works just fine. But what happens if I decide to source something from Washington? Washington won’t accept my California permit. 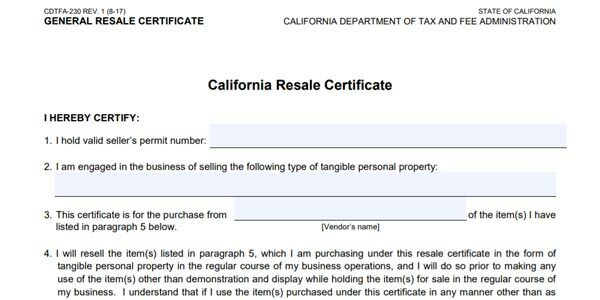 Likewise, if your business is located outside California and you try to buy bulk from me with the intention to resell the items, your out-of-state resale certificate won’t be any good. In order to be exempted from paying sales tax in these cases, you need to go to the state’s issuing authority and apply for a separate sales tax exemption permit. Before you source your items or supplies, make sure you understand how these permits work and apply for what you need ahead of time. Your resale certificate allows you to avoid paying sales tax when you buy. But you still have to collect sales tax on the sale. One of the most important distinctions to keep in mind is the fact that your certificate only helps you avoid paying sales tax on the purchase. It doesn’t exempt you from collecting sales tax. If you live in a state that charges sales tax, you’ll need to make sure you’re set up to collect from your in-state customers, even when they make an online purchase. Another thing to remember is that if you get a resale certificate in a state that doesn’t allow out-of-state certificates, now you’ll have to collect from those customers as well. However, many states are implementing their own laws requiring out-of-state retailers to collect applicable sales taxes from their customers. For example, Utah requires that businesses selling to their residents collect sales tax and then send it along to the state coffers. If you want to sell to people in Utah, you need to make sure you’re collecting sales tax. Today, there are ecommerce shopping carts that can help you collect that sales tax and send it where it needs to go. As you set up your store, consider the impact of sales tax, and look for a cart that can handle charging the right amounts, based on the addresses of your customers. When you apply for a resale certificate, you must be prepared to provide specific details about your business. When applying for a resale certificate, you’ll have to provide certain information to the issuing authority. You’re not just going to get a free pass. Details about your business, such as the name of your company and your address. Some states might ask for your EIN. You might also need to include your sales tax permit number if you have to apply for a separate resale certificate. You might also need to include the type of business you have. Types of items you buy for your business. You might need to list out the items you intend to buy wholesale or the supplies you need for your business. In general, you might be required to attach information about the specific things you expect to get a sales tax break on. Personal details, including your address. This might be important to verify that you are a resident of the state that’s charging you sales tax, or that you don’t reside in a state, but that you’re buying items from that state anyway. Acknowledgment that you’re being truthful in the information you provide on the form. See if you can get a copy of the needed form before you move forward. Most states have copies on their websites, allowing you to see what information is needed. Gather required documentation ahead of time. If you’re required to have an EIN, make sure you apply for one through the IRS before you start applying for your resale certificate. You can only claim a sales tax exemption for goods that you actually plan on selling. One of the most important things to understand about claiming a sales tax exemption is the fact that you can only claim that exemption for items you plan to sell. Your resale certificate isn’t a way to save money on a bunch of items for your business. For example, you can’t stock up on printer ink from a wholesaler and claim a sales tax exemption because you want to save money on your business office supplies. Instead, you need to show that you will actually resell items, or use supplies in the manufacture of items you plan to sell. This is one of the reasons your paperwork might require you to talk about the type of business you have. If you sell handkerchiefs, and you’re claiming a sales tax exemption on printer ink, that raises a red flag. Unless you actually have a storefront that resells printer ink (and probably other office supplies), you shouldn’t be trying to avoid paying sales tax. Before you apply for your certificate, take a step back and really think about what your business needs, and what you actually plan to sell. Those are the items to include in your application. Otherwise, you’re stuck paying sales tax — and that’s just a cost of doing business. Did you get a resale certificate for certain items and then end up not selling them? Technically speaking, if you buy something online as a consumer and the seller doesn’t collect sales tax from you, you’re supposed to report it to your state. It doesn’t matter whether you’re a business or not. State governments, just like the federal government, want their cut. If you’re trying to save money by avoiding sales tax on online purchases, the state still wants to know. For states that collect income tax, this might be part of your income tax reporting. If your state doesn’t collect income tax, but they do collect sales tax, you might have to hunt around for a separate form reporting your purchases. Many consumers just don’t report their non-taxed purchases. However, things might be different for businesses. After all, if the state knows you’ve got a resale certificate, and you’ve bought items with that certificate, they could audit you. If you haven’t actually sold the items you’re claiming on the certificate, they may ask you to pay the tax you owe. Before making purchases using your sales tax exemption, make it a point to know whether or not you’ll truly sell the items. You don’t want to be caught with a use tax after the fact. Finally, realize that there are retailers that won’t accept resale certificates. When you set up an account with a vendor or supplier, you might have a hard time getting everyone to accept your resale certificate — even if they are in the same state. Many wholesalers and other vendors understand the need for the exemption from sales tax, but there are some who are less interested in helping you avoid sales tax. For example, there are some retailers who won’t accept sales certificates and it’s usually the smaller outlets. After all, retailers have already bought their own inventory and have their own profit margins to protect. No matter your situation, it’s best to research suppliers and wholesalers and ask these questions up front. Check into prices and see who will give you the best deal. Sourcing your inventory and supplies is about getting reasonable quality and for a good deal. In some cases, you might not even need to use a sales certificate to come out ahead. Accepting an outside resale certificate requires some amount of due diligence on your part. Don’t forget that, in some cases, you might be in a position where someone wants you to not charge them sales tax when they make a purchase from you. At this point, you need to decide if it makes sense for you to accept sales certificates. Just as others can refuse to accept your certificate, you can deny external certificates as well. Verify the permit: Before you move forward, make sure the permit is valid. Double-check the permit number. And read the certificate to ensure that everything is filled out properly and in order. Consider keeping a copy on file, so that you can use it at tax time if needed — or to make future transactions easier. Make sure that the items purchased are likely to be resold: If you accept a resale certificate and the buyer doesn’t resell the item, you might be in trouble down the road if you haven’t made a good faith effort to make sure they are buying something likely to be resold. If someone wanted to buy a high volume of handkerchiefs from my store, and I checked and saw that they sold office supplies, I might be suspicious. They’re probably not going to resell them; there’s a chance they’re just trying to avoid paying sales tax on favors for an event. In general, you should be careful when processing a resale certificate from a buyer. In the rare event that the resale certificate turns out to be invalid and you neglected to charge sales tax, you could end up on the hook to pay that sales tax out of your own funds! While this is unlikely to happen and you’re not totally responsible for what someone does if they buy something from you, you do need to at least make an effort to verify the story before you grant a sales tax exemption. Depending on your business, and your needs, a resale certificate can make a lot of sense, since it can save you money, especially on large inventory or supply purchases. Additionally, if you are in a position where people might buy large quantities from you, accepting a certificate can allow you to provide competitive pricing. You’re letting the buyer off the hook for sales tax. Before you provide or accept such a certificate, it’s important to think about the lifetime value of this customer. If you believe that there could potentially be a long term relationship with this customer, it’s generally worth it to accept the resale certificate. If you get a Florida Resale Certificate (and maybe in other states, too), you’ll have to remember to send in monthly reports – every month. Whether or not you sold anything that month! I can’t tell you how many $50 fines I’ve paid in the past for forgetting to submit the monthly report on time. Florida does allow you to “retain” a small percentage of what you collect for your own “administrative fees.” Sweet.